If you've visited our website and looked around the online store, or if you've stopped by our shop then you will have seen that our counters are telling us that there are just 3 days and so many more hours left until Santa is coming to our homes, if you believe in that sort of thing. Regardless of your belief in Santa Claus there are only 3 days left until Christmas Day, of course you may not celebrate Christmas and that is perfectly fine, I wish you a Merry, Happy, Joyous, seasonal holiday of your own choosing. In our home we celebrate Christmas, it's my most favorite time of year. As you know I love to give and that includes discounts & Sales. Here in our area the day after Christmas is called "Boxing Day". What a wonderful day, similar to our Southern neighbors with Black Friday, the day after Thanksgiving; we have a huge sale (mind you it's not quite as large as Black Friday :( ) but it's a sale nonetheless. 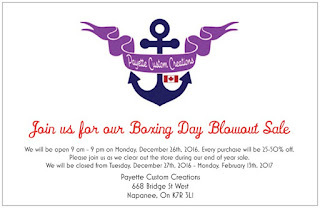 Here at Payette Custom Creations we have decided to have a huge Boxing Day Sale where EVERYTHING IN STORE and we're offering it all at 25-50% off. "What's the catch? ", yes, I heard you think that... the catch is that it's IN STORE only, one day only. And after our sale we will be closing the store for the rest of the year. As of 9 pm December 26th, 2016 we will be closed and will not reopen again until Monday, February 13th, 2017. In that time we will be doing a little renovation, a lot of making of new products and best of all, spending much overdue time with our family. What's that? You live too far away and cannot come into the store? Don't worry, After the store closes on Boxing Day we will reopen our webstore (yes it will be shut down during our store's sale hours) and we will continue to have a "Boxing Week Sale" ONLINE ONLY where all remaining IN STOCK items will then be listed online for 25-50% off and the best part is, your orders will ship the SAME BUSINESS DAY, if you place your order by 7 pm EST. 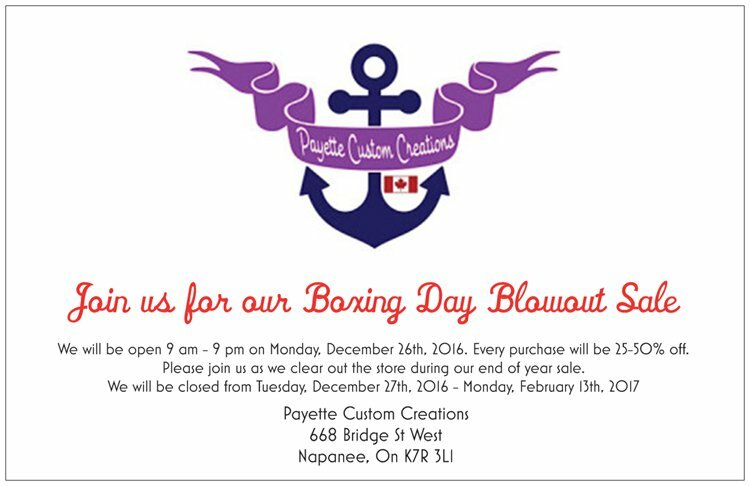 Our online Boxing Week Sale will run from December 26th at roughly 10pm until 11:59pm EST on Saturday, December 31st, 2016. At which time our webstore will return to it's former pumpkin form and all sales will end. But regular ordering will still be possible while our storefront is closed for the month of January. We will be happy to set up times for picking up of any items order ed from local customers, please just leave a list of 3 dates, that would work best for you for picking up, in your "order notes" so that we can arrange to accommodate your pick up. I also want to take time, again, to thank everyone for their support and business this holiday season. It's been a pleasure to work with you all.